NASA is once again bracing for a potential shutdown of the federal government, which could begin this weekend if Republicans and Democrats in Congress can't agree on a budget. 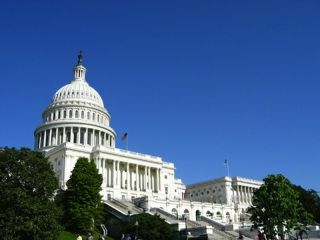 U.S. lawmakers have yet to pass a budget for fiscal year 2011, which began in October. As a result, the government has been operating under a series of stopgap funding measures called continuing resolutions. The latest of these is set to expire at 12:01 a.m. EDT Saturday (April 9). NASA officials expressed hope that Democrats and Republicans can reach an agreement in time to forestall a government shutdown— but they're not necessarily counting on it. "Given the realities of the calendar, however, prudent management requires that we plan for an orderly shutdown should Congress be unable to pass a funding bill," NASA chief Charlie Bolden wrote in a recent memo to agency employees that was posted online by the website SpaceRef.com today (April 6). At this point, Republicans are seeking deeper cuts in federal spending than Democrats are willing to concede. If the two sides can't come together by Friday, the federal government could shut down for the first time since 1995. Federal activities deemed essential to the nation's safety and economic well-being — such as air-traffic control and food inspection — would continue to receive funding. But many other operations would be suspended, and many federal employees furloughed. NASA has now begun the process of trying to figure out which of its operations and employees would be affected. "Our contingency planning for the potential funding lapse includes determining which agency functions are excepted from a furlough," Bolden wrote. "Should it become necessary to implement our contingency plans, you will receive formal notice from your manager no later than Friday, April 8th regarding the designation of your position and furlough status." "Essential" employees exempt from a furlough would almost certainly include anyone involved with keeping astronauts safe and healthy in space, NASA officials said — not to mention the astronauts themselves. There are two NASA astronauts in space today – Cady Coleman and Ron Garan. They are two of the six spaceflyers making up the International Space Station's Expedition 27 crew. Coleman and two crewmates are currently living on the station. Garan and two other crewmembers will arrive at the orbiting laboratory tonight. They launched into space Monday aboard a Russian Soyuz spacecraft. "We will take the steps necessary to ensure the safety of our astronauts on the International Space Station and our other missions," said NASA spokeswoman Katherine Trinidad. "Critical personnel will remain in place." Engineers and technicians actually operating the various NASA spacecraft flying through the solar system could probably stay on as well, experts have predicted. Researchers analyzing spacecraft data, on the other hand, might have to go home for a spell — along with large numbers of support staff, from cafeteria workers to office managers. NASA's next space shuttle flight — Endeavour's STS-134 mission to the space station — is slated to launch April 29. The space agency is looking into how a government shutdown might complicate preparations for that flight, the shuttle program's second-to-last before it retires later this year. "NASA is still assessing the potential impact to orbiter processing and the upcoming STS-134 mission," Trinidad told SPACE.com. This is not the first time a possible government shutdown has loomed. Just last month, for example, lawmakers avoided a potential shutdown by passing another continuing resolution. And in November 1995, President Clinton and congressional Republicans — led by then House Speaker Newt Gingrich — couldn't come to an agreement in time. A shutdown ensued right in the middle of the space shuttle Atlantis' STS-74 mission to Russia's Mir space station. NASA employees considered essential to that mission stayed on. But many other workers were furloughed, including NASA's public affairs office. The 1995 shutdown dragged on for three weeks. While NASA officials hope lawmakers can avert such an incident this time around, they're firming up employees' resolve just in case. "Your contributions touch people's lives in so many significant ways, and I want you to know how deeply I appreciate your dedication and your expertise," Bolden wrote in the memo. "We're a determined and resilient team and we'll get through this!"